Billie Holiday was a true artist of her day and rose as a social phenomenon in the 1950s. Her soulful, unique singing voice and her ability to boldly turn any material that she confronted into her own music made her a superstar of her time. Today, Holiday is remembered for her masterpieces, creativity and vivacity, as many of Holiday's songs are as well known today as they were decades ago. Holiday's poignant voice is still considered to be one of the greatest jazz voices of all time. Holiday began working with Lester Young in 1936, who pegged her with her now-famous nickname of "Lady Day." When Holiday joined Count Basie in 1937 and then Artie Shaw in 1938, she became one of the very first black women to work with a white orchestra, an impressive accomplishment of her time. In the 1930s, when Holiday was working with Columbia Records, she was first introduced to the poem "Strange Fruit," an emotional piece about the lynching of a black man. Though Columbia would not allow her to record the piece due to subject matter, Holiday went on to record the song with an alternate label, Commodore, and the song eventually became one of Holiday's classics. 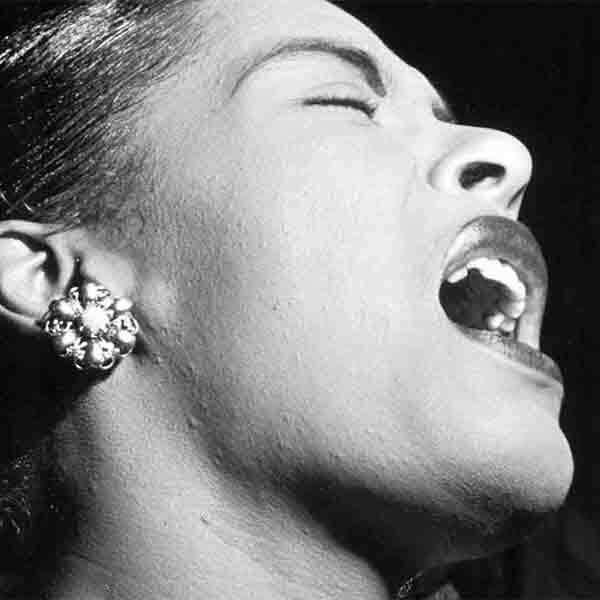 Despite her lack of technical training, Holiday's unique diction, inimitable phrasing and acute dramatic intensity made her the outstanding jazz singer of her day. White gardenias, worn in her hair, became her trademark. Her emotive voice, innovative techniques and touching songs will forever be remembered and enjoyed.